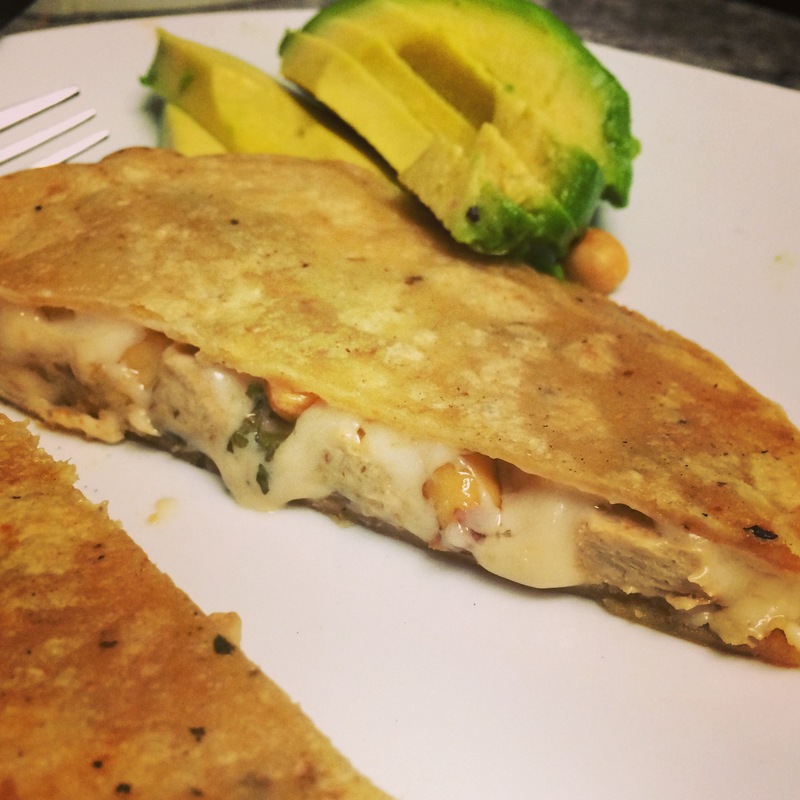 The only down side to this recipe is it made for a lot of left overs, but I threw those in some tupperware with rice instead of on more quesadillas. First fry up some vegan TJ’s chick’n strips and one bag broccoli florets in a little veggie oil. In a bowl stir up 4 TBsp ginger, 2 tsp tabasco, 1 cup peanut butter, 4 TBsp soy sauce, 4 TBsp lime juice. Mix the chick’n and broccoli in to this when done. Take a tortilla and spread shredded vegan jack cheese over it. Then top with the chicnk’n and broccoli mixture on that. Sprinkle some peanuts on that. Then another layer of cheese and another tortilla. Fry and enjoy. Well, in my last post I talked about loving mushrooms, which I do, but I think asparagus is my favorite vegetable (which is good, that means mushrooms and asparagus don’t have to compete, asparagus wins for veggies, mushrooms wins for fungi). This is another pizza that turned out lovely. First I boiled some asparagus and fried a package of TJs vegan chick’n strips in a small amount of olive oil. Meanwhile the oven was set to 550. 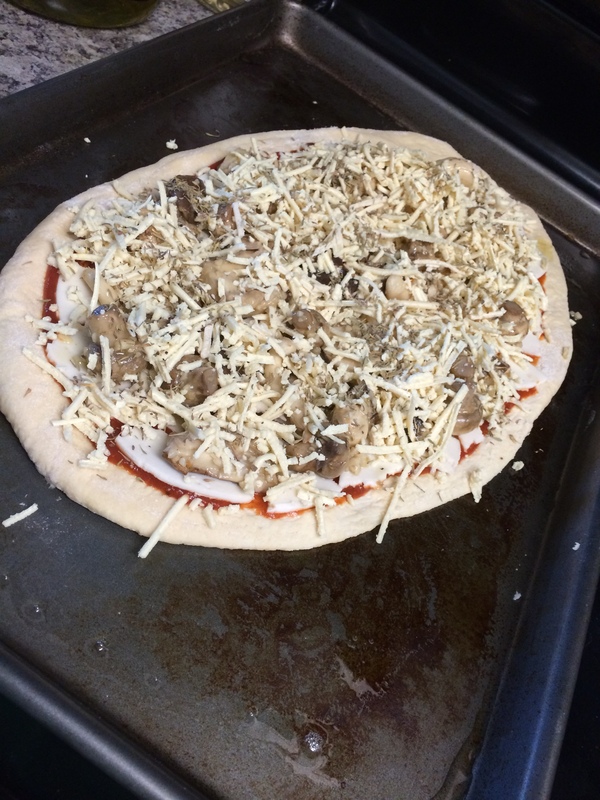 Roll out your dough, spread your pizza sauce on it, then I topped that with shredded Daiya provolone. 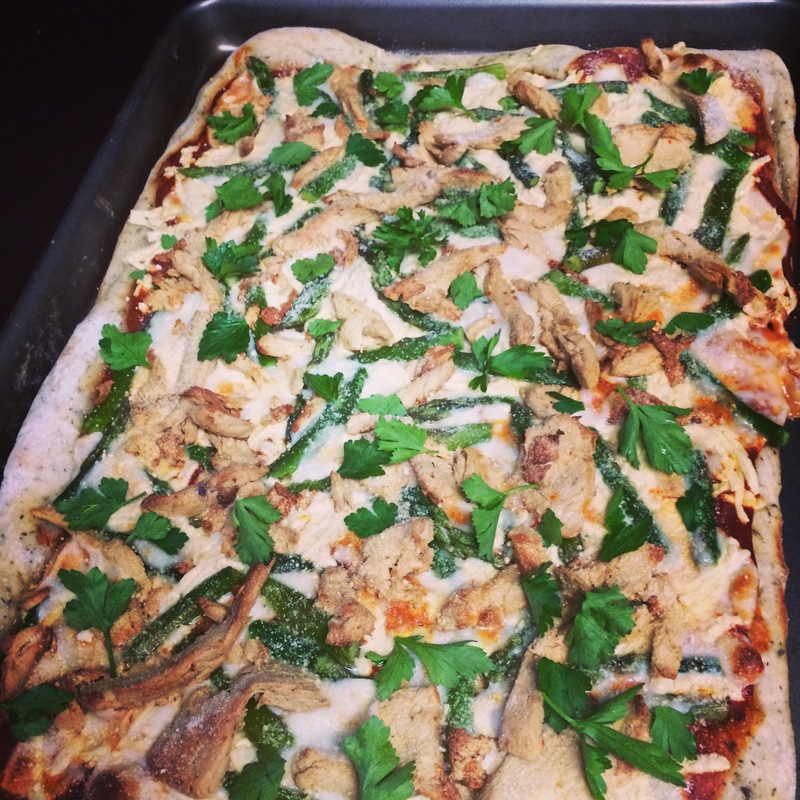 Then I topped that with the chick’n and asparagus, a little sprinkling of daiya mozzarella, and lastly some fresh parsley. Bake for 10 minutes. Once out of the oven sprinkle with a little vegan parmesan. This pizza was one of the best I have made in a while. God I love mushrooms. And pizza is probably my favorite meal. So this super simple recipe was so easy and wonderful. Preheat the oven to 500. 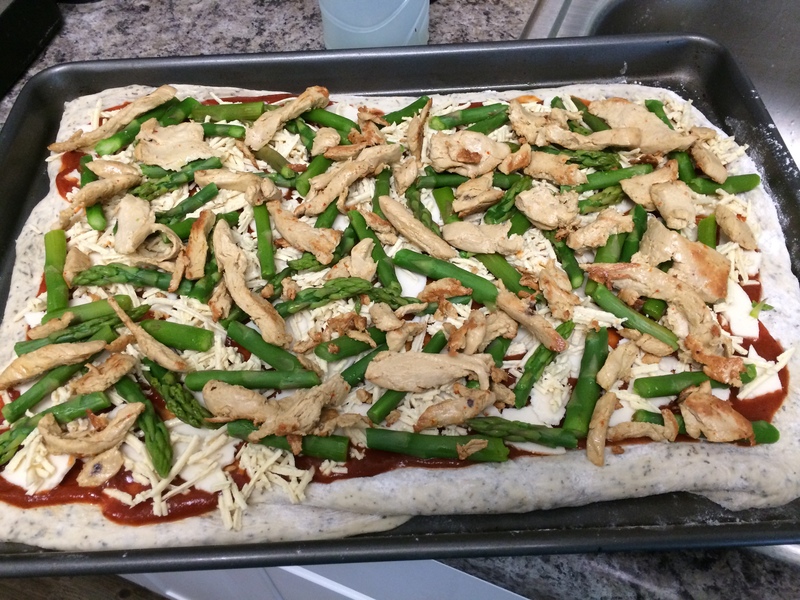 I am lazy and always use pre-made pizza dough, I prefer TJ’s as it is vegan (most are, but always check the ingredients). In a large skillet I fried up some olive oil with shitake, bell, and oyster mushrooms as well as 2 TBsp minced garlic. 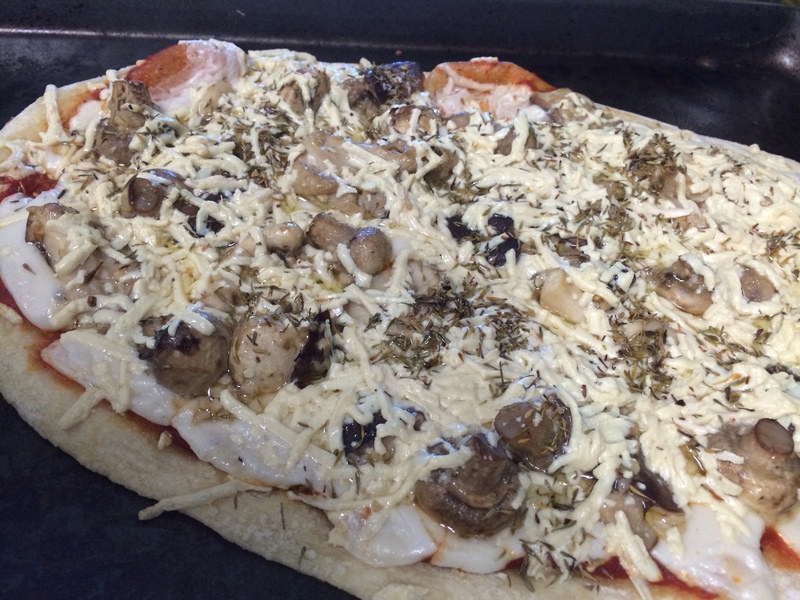 Then the pizza was basically a layer of pizza sauce, then a layer of shredded Daiya provolone, then the mushrooms, topped with Daiya mozzarella and some thyme. Baked for 8 minutes. I have complained to many about my bad habit of not regularly eating breakfast. It mostly consists of eating Clif Bars these days. I used to be better about it, but that was when I got up earlier and ate cereal at home. Now I just want to roll out of bed and in to my scrubs to head to work. So I often try to eat breakfast at work. Bringing cereal and soy milk is annoying, and baked goods are not often vegan friendly (I am more of a cook than a baker). 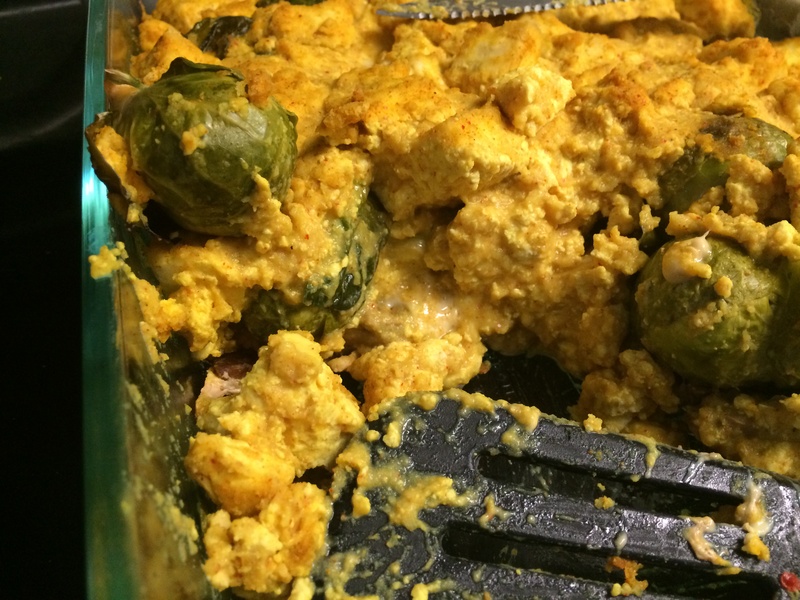 I tried this new recipe this week: a breakfast casserole with several changes that I added, including adding brussel sprouts. Why? I love them, and they were on sale at Whole Foods, so I had to add them in some how. Basically I took some sourdough slices and layered them over a large casserole dish. Meanwhile I broiled the brussel sprouts. In a large bowl I mashed up one package of firm tofu. Then I mixed in 1/2 cup of potato flakes (make sure they are vegan), 1 tsp chili powder, 1/2 tsp cumin, 1/2 tsp tumeric, and 1/2 tsp curry powder. Then I mixed in two cups of almond milk and let it soak. In a skillet I fried up some vegan bacon, using tofurky’s maple smoked tempeh bacon this time. Once the brussel sprouts were done I mixed them with the tofu/potato mixture. Going back to the casserole I topped the bread slices lining the bottom with a mixture of Daiya pepperjack and mozzarella cheese. Then the vegan bacon on top of that, and lastly the tofu-potato mixture on top of that. This whole thing sat in the fridge overnight and then I baked it at 350 the next morning for 45 minutes. It goes well with ketchup. The one thing that I would do differently: not use sourdough in the future, I think white bread would soak up the juices and be sliced easier. But not bad. Thank you again Trader Joe’s for making quality vegan sauces that make the creation of a stir fry super easy. 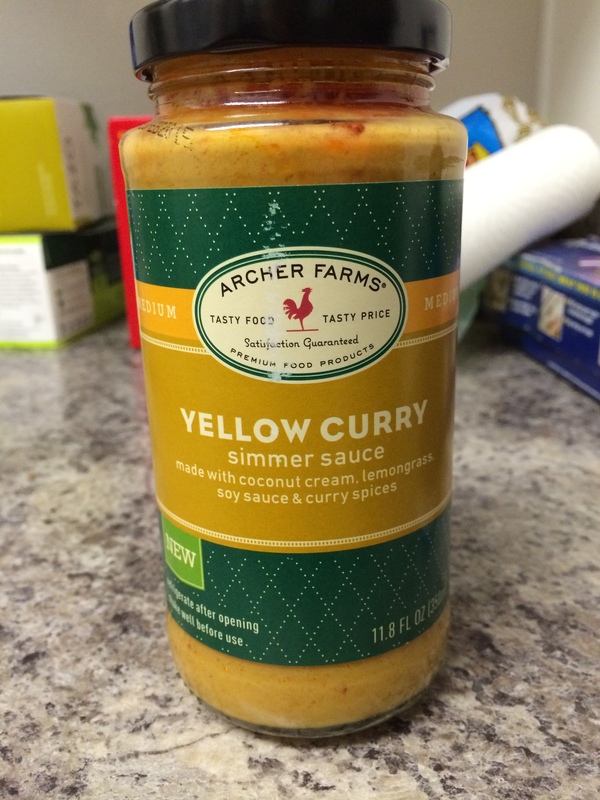 Used this TJ’s sauce and a mix of veggies from Whole Foods to throw together a tasty Yellow Curry (as well as some seitan strips). Sometimes a simple pasta recipe is all you need…. I haven’t been cooking as much as I like recently, mainly for good reasons: I have awesome friends and co-workers in California who like to be social just as much as I do, and there are ample vegan options in California at restaurants. So I have been going out to dinner a couple times a week, which cuts in to my cooking time. Made a few recipes this week though. And sometimes I find a leftover pasta dish really just hits the spot. It’s like my way of emptying the cupboards. 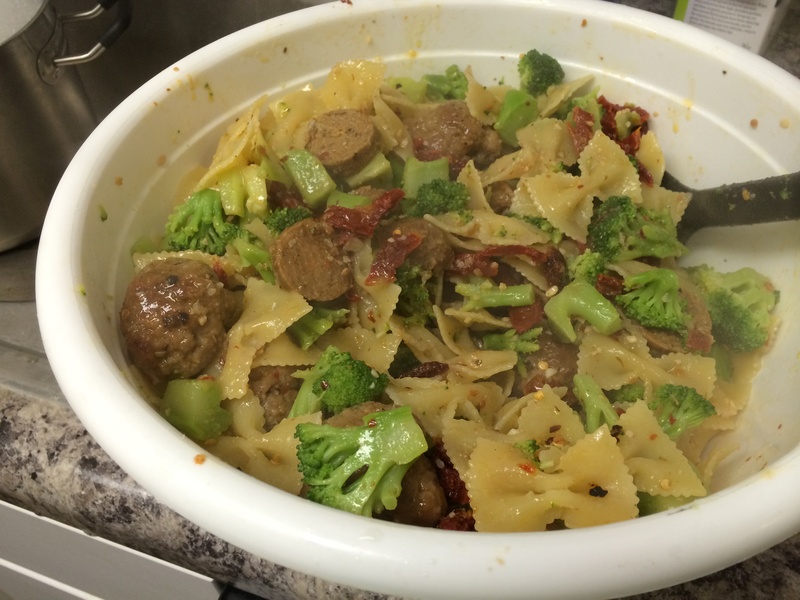 This recipe was super simple: I had a bag of frozen broccoli and a bag of farfelle pasta that I boiled together. 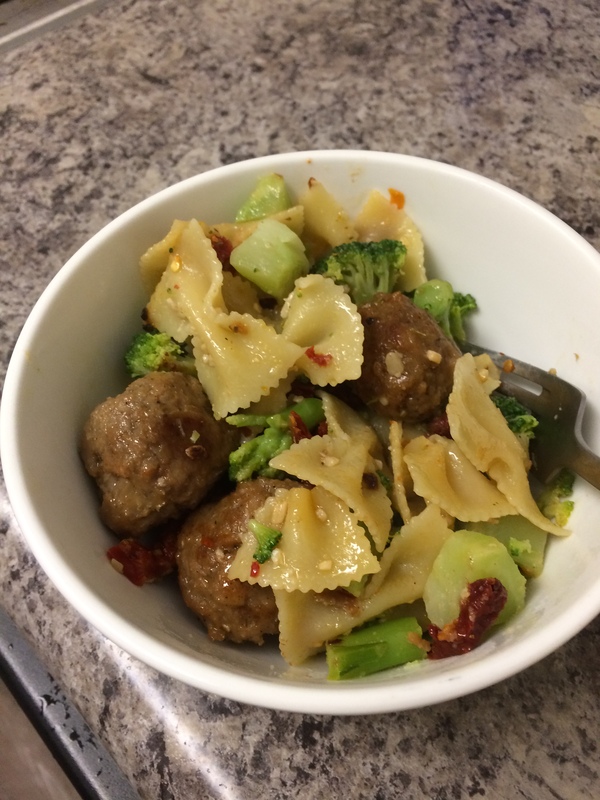 Then I had a can of sundried tomatoes that I mixed in with the pasta and broccoli in a large bowl once it was cooked, and then I had some leftover vegan sausage (two different types) that I fried up and mixed in. Add 2 TBsp olive oil and 1 TBsp red pepper flakes and bam, super simple and yet delicious dinner. And leftovers for the week.